The music is blaring as you pass the merry-go-round, but then something catches your eye. It’s your reflection, but something is not quite right. At first glance, you are short and plump and next you are tall and lean. If you’ve ever been to a carnival, you have probably seen one of those funny mirrors that make you look distorted. Looking into each mirror gives you a different shape. Some are better than others. I, personally, like the one that makes me look like I’m ten pounds lighter. According to webster.com, distortion is a lack of proportionality in an image resulting from defects in the optical system. I guess to put it simply…your eyes see things as they should not be. Well, distortion doesn’t not just happen with my eyes; it happens with my thought patterns as well. At this point, it is easy to look in the mirror and see all the imperfections. The mounting confidence I had the day before has been distorted. When the bigness of my reality seems to become bigger than my God, I will turn back to the truth. The thoughts I think about myself begin to have an impact. In my distorted view, I start believing how could He love a girl like me. I am not made whole in His image. He does not have the power to restore me. I’ve messed up too much. He does not see me and love me as I am. How could He? He reaches in the depth of my soul to say He loves me. He reminds me that He loves me despite my performance. Even if I dropped all the balls and not one single thing gets done on my to-do list, or I have to ask for forgiveness for the thousandth time, His love would not budge one bit. If I linger in the love and grace that God has for me, this changes my whole perspective. My friend, satan attempts to blind us. We begin to see things as they really aren’t. Our reality becomes a reality of distortion. Cling to the truth of God, then the true reality will be easy to recognize. Great post, Denise. 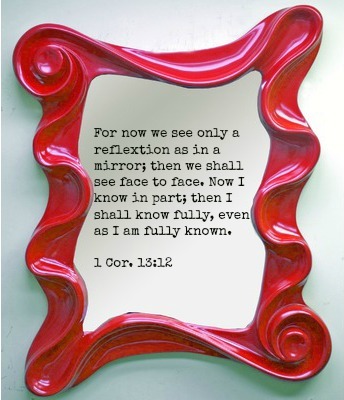 Oh, how when we take our eyes off the truth and off God, the enemy jumps in to distort everything. We must keep our eyes on the King of Truth. Thank you for that reminder!